The caviar in the title actually refers to the aubergine seeds, or ‘eggs’. Preheat the oven to 200˚C (400˚F). Rub the aubergines with 2 tablespoons olive oil. Bake on a baking sheet for 30 minutes, until the aubergine softens and turns dark brown. When cool enough to handle, remove the tops and slice lengthways. Using a spoon, scrape the flesh away from the skin. Discard the skin and roughly chop the aubergine flesh. Set aside. Place 12 paper baking cups in muffin pans. In a medium bowl, combine the dry ingredients. In a large bowl, beat the egg, milk and remaining olive oil. Mix in the flour mixture until nearly combined. Fold in the chopped aubergine. Spoon the mixture into the prepared pans. Bake for 25 minutes. Remove pan from the oven and cool for 5 minutes. Then remove the cupcakes and cool on a rack. To make the butter, combine the butter, garlic, vinegar and basil in a bowl. Beat until well combined, then season with salt and pepper. 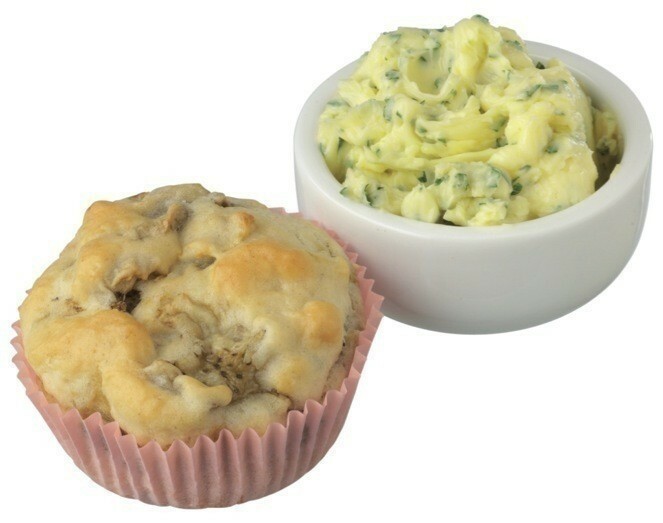 Spread over the top of the cupcakes or serve as an accompaniment on the side.